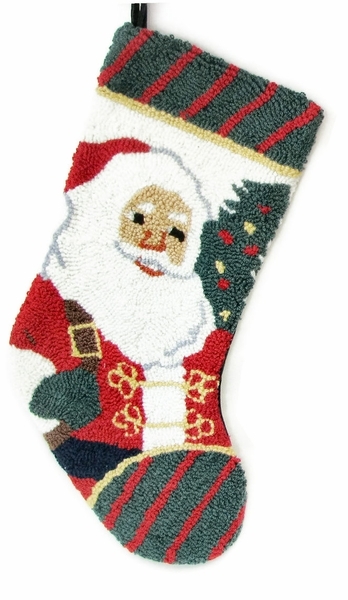 20" Christmas Stocking - wool hooked Santa Design front. Back is green velvet, inside is lined with cotton fabric. This stocking has the ultimate hand made look and feel with a maximum attention to every detail. Personalized on the cuff. We suggest personalization in either WHITE, GOLD or SILVER thread so the name would stand out. If possible keep the name in shorter version: e.g. if the name is Alexander, personalize as Alex, Christopher personalize as Chris. Because this stocking design is hooked - you want to have big bold letters- and short name with a few letters will turn out great, if you specify long name, we have to fit all the letters into a fixed space of about 4&quot; and thus we would need to make the letters thinner and skinnier to fit them all into that space... so if you want a gorgeous personalization, keep the names on the shortest version possible. Personalized Santa Christmas Stockings - Hooked wool Christmas Stockings. This is 20" Velvet Christmas stocking with a Hooked Santa Design. Complimnetary designs of Hooked Christmas Stockings are available so you can make a set. Measured along the diagonal from the top left hand corner to the toe, the stocking measures 20 inches, and the width along the cuff is 7.5 - 8.00 inches. Materials: The stocking is made from velvet with wool hooked design on the front! The inside lining is from soft designer cotton fabrics. This is very high end look and feel Christmas stocking which will surely become a family heirloom. Lining: YES. This stocking is fully lined in cotton designer fabrics.